Experience the wintertime magic of Siberia on an unforgettable railroad journey from Moscow to Mongolia. A fairy tale of snow and ice awaits you. It’s a beautiful winter’s day in Moscow, where you are transported from the airport to your first-class hotel in the city center. That evening, you take a stroll through the city and feast your eyes on the stunning illuminations of Red Square before enjoying a dinner at the hotel. Your second day in Moscow starts off with a panoramic city tour, where you experience this metropolis from end to end—enjoying its mix of traditional golden domes and modern skyscrapers. Later you have lunch in a Russian history-themed restaurant before you board your private train to continue your unforgettable journey. After breakfast, you arrive in Vladimir where you take a bus to Suzdal, one of the oldest and most beautiful cities in Russia’s Golden Ring (a group of historic, ancient towns). There, you see the Suzdal Kremlin, the Cathedral of the Nativity and the Monastery of Saint Euthymius, a UNESCO World Heritage Site. Around noon, you return to your private train and travel east through the vast plains of old Russia, crossing the Volga and Kama Rivers before climbing the Ural Mountains—usually covered in massive deposits of snow this time of year. Later on board you enjoy talks about the Cossack conquest of Siberia, Russian life in winter, and the last of the Tsars. Today you stop for a city tour in Yekaterinburg, where Tsar Nicholas II and his family were assassinated in 1918. The Cathedral of All Saints is a memorial to their murder and a part of your tour. Later you board your private train once again and continue through western Siberia. In the morning, you reach Krasnoyarsk. During an informative city tour, you learn revealing facts and stories about the city’s history. As you stroll through the city’s old and new streets, you walk through Peace Square, enjoy views of the Yenisei River, and visit the Paraskeva Pyatnitsa Chapel. Today you reach Irkutsk, one of the largest cities of eastern Siberia. On your guided city tour, you see the Ethnology Museum, the Trans-Siberian monument, the Drama Theater and a bustling market hall. Your city tour continues to one of the largest monasteries in eastern Siberia and to the Europe House. That evening you reach the Baikal town of Listvyanka and have the opportunity to enjoy the warmth of a real Russian banya (sauna). Today you take a ride on a horse-drawn carriage and a snowmobile or dogsled on frozen Lake Baikal. You also have the opportunity to get a panoramic view from the sky in a ski lift (during business hours). You enjoy a delicious Russian dinner with a local family. Also on the agenda is a visit to the Baikalian Research Center, where you learn about studies being conducted on the lake. In the evening, your private train departs from Irkutsk. Day 9. Lake Baikal Today, your private train arrives at the original track of the Trans-Siberian Railroad. For several hours, you travel along the coast of the lake and have the opportunity to take a walk on its frozen surface. Later, you enjoy a short presentation about the area. You continue on your way through the steppes of eastern Siberia—through the gorgeous, snow-covered Selenga Valley. You make a stopover in Ulan-Ude where you tour the city, then continue on to the Russia–Mongolia border, where border checkpoint formalities take place. In the morning, you reach Ulan Bator. Here, you can spend the night in either a hotel or in a heated nomadic felt tent outdoors in the near-freezing wilderness—an extraordinary experience! In the afternoon, you visit the Mongolian National History Museum. Later, if you choose to stay overnight in the hotel, you have the opportunity to watch a traditional folk performance, which features throat singing, costumes, dances and the horse head fiddle—the morin khuur, a symbol of the Mongolian nation (entrance fee payable on site). If you decide to spend the night in a traditional tent (requested in advance), you enjoy Mongolian folk tales by the campfire. Today, you visit the painstakingly restored Buddhist Gandan Monastery and the jewel-like Choijin Lama Temple. An afternoon excursion takes you to a family of cattle herders just outside of the city. Learn how they and their animals spend the Mongolian winter. If you would like your winter’s tale to continue on from Ulan Bator, please ask us for details. 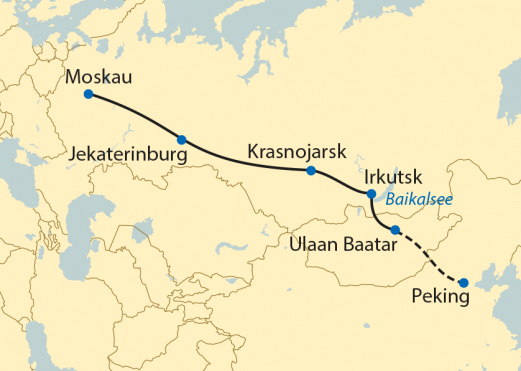 Riding the Trans-Siberian Railroad is an amazing adventure any time of the year. But winter brings out the true soul of the Russian taiga. Go on a troika sleigh ride, or stroll through a snow forest in the winter morning sun and even get the chance to sleep in a Mongolian tent! Explore Russia and Mongolia during the colder season from your snug, Trans-Siberian train. Hop aboard for a snowy voyage that is captivating, convenient and secure. It’s the winter experience of a lifetime!